The fantasy football season's outcome is often decided before real NFL players take the field for meaningful games. Separating your team from the crowd takes analysis -- based in logic, math, and knowledge of the unique quirks of a league. In fantasy football, wins are not earned during the brutal twice-daily August practices, but by preparing in front of spreadsheets of statistics or player rankings developed by experts. The object of fantasy football is simple: compete against other fans to accumulate the highest total of fantasy points, which are awarded based on the performance of real players in real games. Rosters usually include players from many different NFL teams: quarterbacks, running backs, wide receivers, tight ends, kickers and sometimes an entire defensive unit. The most common types of fantasy leagues pair off their teams into matchups each week, and each team's combined results -- yards gained and touchdowns scored, among other statistics -- earn points, with the highest point total winning the matchup. The team with the best overall record wins the league or the best seed for playoff rounds. There are typically 10 or 12 teams in a league, which usually stage a draft of players, taking turns making pressure-packed choices over multiple rounds, hoping that the best players somehow remain available for your team to choose. Success is highly dependent on how well the team is built. Joseph Menicucci knew this as a kid helping his dad win fantasy football leagues 25 years ago. He scoured each Monday's papers to compute each fantasy team's point total. Back then he also gained an edge by working harder than his opponents to research injuries and roster changes. "As more and more owners had access to the internet, our competitive advantage really dwindled," said Menicucci, whose accomplishments now include a doctorate in chemical and biological engineering and becoming the president of an alternative energy company, in addition to numerous fantasy football titles. Today, casual fans make use of the sophisticated advice available from fantasy football experts on television, the internet, and in magazines when preparing to assemble their teams. The problem is that once fantasy players dig deep into experts' rankings and lists of underrated players, it's as if everyone is using the same playbook. Even when competing against a group of people with computers full of statistics and projections, analyzing that information better than anyone else can provide a clear edge. This is the aim of Adrian Becker and Andy Sun, graduate students at the Massachusetts Institute of Technology in Cambridge. Their system grew out of a course where they learned to apply the techniques of the discipline they study, operations research, to a wide variety of problems. "[In] a fantasy football draft say with 12 people, you'll be playing against a different person in your league every week. So the only scores that really matter for that week are your scores -- the scores of the players you draft -- and the scores of the players drafted by your opponent for that week," said Becker. For this reason, the distribution of the points a player accumulates matters more than the total number. A fantasy team's week one opponent might be projected to score far fewer points than its week two opponent. All wins count the same, so there's no need to blow out the opposing fantasy team. For that reason, finding players likely to beat up on poor NFL defenses in week two would be more important than what the players do in week one. Becker and Sun developed a computer program designed to choose the player who best fits their team, in order to build the team likely to win the largest number of weekly fantasy matchups. "There's really no, that we know of, comprehensive strategy for the entire season incorporating both the draft and the weekly lineup management," said Sun. "That analysis is very hard to do on paper," said Becker. The program solves what is called a robust mixed integer programming model, which is run before each fantasy draft pick and after each week to consider replacing players on your roster with unsigned players. Sun said this allows them to consider every consequence of a draft choice and to ensure that they choose the players that most increase the team's likelihood of winning the most fantasy matchups. Their model depends heavily on player and team data from past seasons, which it uses to compute the probable outcomes of NFL matchups -- statistics like rushing yards, touchdown passes and more. As a consequence, Becker and Sun's model is least well equipped to predict the performance of inexperienced players like rookies, so they fold in information from outside experts. It has been successful, however. 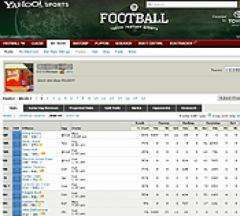 In 2007 they took their model and nine expert rankings from different fantasy resources and simulated a league. Their team came in first or second place in the regular season 45 percent of the time. In 2008 they tried it again and finished first or second 40 percent of the time. They are still collecting the data needed to complete their model for this year, but both plan to use it when they choose fantasy teams for 2010. The model isn't available commercially, but fantasy players can draw a few lessons from it, including the importance of both types of matchups -- the NFL teams facing the players on your fantasy team, and each week's fantasy opponent. The next step in perfecting their system, said Becker and Sun, is adapting their model for leagues with different structures, such as those designed around a salary cap -- which will allow them to compare their method to thousands of others simultaneously. • First, check your league settings. Consulting an expert's list may not help if your league uses a different point system. • Second, don't depend on players duplicating the number of touchdowns scored last year. "It's tough to predict touchdowns. It just is," said Menicucci. • Third, if you are looking for sleeper running backs, watch for those with a demonstrated ability to catch passes, such as Fred Jackson from the Buffalo Bills and those who run behind good offensive lines, such as LaDainian Tomlinson and Shonn Greene from the New York Jets.